Trump’s reaction offers another capsule of his habit of twisting the truth regarding his real estate deals — one of the patterns revealed in a recent ProPublica and WNYC investigation, “Pump and Trump,” which focused on a deal in Panama. That article concluded that, contrary to the Trumps’ longtime claims that they merely licensed their name, they were deeply involved in their deals. The Tampa project began, as did many Trump endeavors, with improbable partners: five Tampa-area businessmen eager to develop a 1.5-acre downtown site they owned. The group’s managing partner was Simon, a burly retired professional wrestler with a shaved head who had brawled under the name Joe Malenko and drove a Rolls-Royce. After retiring from the ring, Simon had launched, and sold, a successful medical-education company with his partner Frank Dagostino, a second member of the developer group. The three others were a local builder and a dentist who’d partnered with a real estate broker. The five men incorporated as SimDag/Robel LLC. Collectively, they’d developed some strip shopping centers and condo projects. None had ever built anything approaching a 600-foot tower. A New Jersey real estate broker named Roman Osadchuk introduced them to executives at the Trump Organization in May 2004. From there, things moved rapidly. As they did in such deals, Trump’s team negotiated upfront fees in return for licensing his name. The final terms: $4 million (to be paid in monthly installments), as an advance against 50 percent of all project profits. The Trump Organization, it would turn out, did not vet the developers closely. But the company was strict in one respect: It insisted that the developers personally guarantee the licensing fees. Trump’s involvement wasn’t limited to selling his name. The licensing agreement gave him “review and approval rights” for virtually every aspect of the project. It required physical delivery to the Trump Organization of “all plans and specifications” for building design, engineering, floor plans, fixtures, lighting, exterior landscaping, and all sales and marketing materials — even the location and layout of the sales office. All were subject to “written confirmation that they comply with the Trump Standards,” an issue on which Trump himself would be the “sole judge.” The Trump Organization was to have access to the property and all project records at all times. But first, there was the matter of the name. The Florida developers had been referring to the building, planned to rise along the Hillsborough River, as the “Tampa Riverside Plaza” project and were considering new versions in the vein of the “Trump Riverside” or the “Trump Tampa Riverside.” Trump quickly scuttled those ideas. “He strongly prefers Trump Tower Tampa,” Trump Organization executive vice president Russell Flicker told them, according to one of the emails that Trump’s company provided in litigation. And so it would be. The $220 million tower was touted in a press release as a “Donald J. Trump Signature Property” — an “ultra-luxury” building featuring concierge and valet services, a fitness center and spa, a fine art collection, and “imported marble floors with inlaid onyx highlights.” Its 190 condos would command prices ranging from $700,000 to more than $6 million. 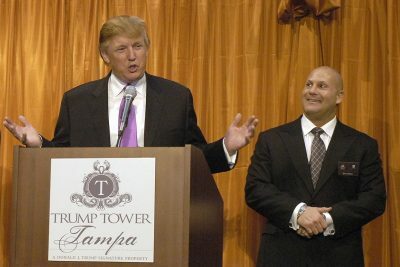 In February 2005, Trump appeared in Tampa, on one of his two contractually required all-expenses-paid marketing visits. (Maximum length: six “working hours.”) He arrived in a black limo with his new wife, Melania, sweeping into town “like a crown prince,” as a story in the St. Petersburg Times (which has since changed its name to the Tampa Bay Times) described it. Greeted by Tampa’s mayor, Trump was the showcase attraction at a gala marketing event for more than 600 invitees. Spurred by excited belief in Trump’s Midas touch — and about his personal commitment to the Tampa project — reservations for the condos, requiring a 10 percent refundable deposit, were going fast. 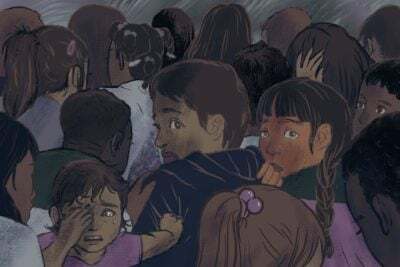 Trump said that 98 percent of the 190 units had been reserved even before he touched down in Tampa, according to a St. Petersburg Times article at the time, and he had more than a hundred “backup” reservations. In his letter to The Wall Street Journal, Trump would assert the Tampa building ultimately “sold out.” That statement was false. Court documents show only 109 of the tower’s reservations (57 percent of the building) turned into actual sales. In truth, Trump hadn’t invested a dime — a fact he was keeping secret, with the help of a strict confidentiality provision in his licensing agreement, which barred anybody in the project from revealing Trump’s lack of equity. Trump also said his son Donald Jr., who would emerge as a point man on the deal for the Trump Organization, was buying a unit in the building. That was less than certain. In testing the ground at the site, the developers had discovered the terrain was too soft to support a 52-story building without tens of millions in extra foundation and design work. In March 2006, the project’s general contractor, a prominent national firm, dropped out. One potential lender after another dropped out. A Chicago bank that had loaned to another Trump-branded project demurred because the developers hadn’t sold enough condos to meet the bank’s financing standards. The Trump Organization monitored the situation closely. At one point in 2006, Diamond advised Donald Jr., Ivanka and Cremer that Deutsche Bank is “the only game in town.” But that didn’t come together either. In August 2006, Donald Trump began to publicly express anxiety about the project, telling a reporter “this is the only job I have in the world that isn’t going up quickly.” Another sign of his concern: He reversed his previous position that he had an ownership stake and disclosed that, in fact, he merely had a licensing deal. 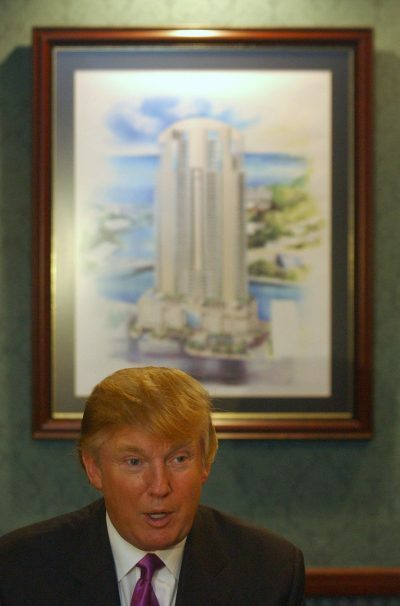 Trump announced he was considering a buyout of the Tampa developers’ interest to rescue the situation. “I could build that [tower] out of my back pocket,” he boasted to the Tampa Tribune. “This isn’t a big job for me.” He also insisted he could easily find financing. “Banks love me,” he said. “Why do I get the feeling that nothing good will come of this?” Weiss replied. Trump’s deputies began gathering cost data on the project. But by late August 2006, there was another option. The developers had approached the Related Group, a prominent Miami developer that had built other Trump-branded Florida condo towers, about taking over the Tampa project. By the fall of 2006, estimated costs were soaring toward $300 million. Two general contractors had dropped out. Liens were being filed for millions in unpaid bills. And more than 40 percent of the condos remained unsold, after dozens of buyers had canceled their reservations and pulled out. The projected completion date had slipped into 2009. Related proposed tough terms to rescue the venture, including a provision that would eliminate the Trump Organization share of the profits and replace it with a fee for each condo unit sold. Donald Trump Jr., 28 at the time, was furious. There were larger considerations to weigh, Donald Jr. noted. 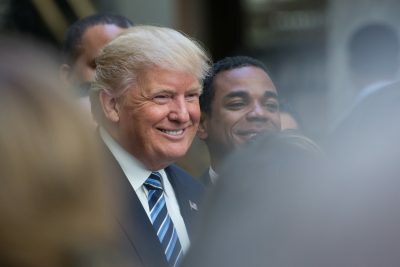 “I cannot stress enough the importance of not having any failures this early in the process of building up the licencing model,” which had emerged as the Trump Organization’s strategy. Bad publicity was another. Forbes magazine was preparing a cover story on “The Real Apprentices” — how Trump’s children were faring as his prospective business successors. A failed deal on their watch would damage the narrative. On Nov. 10, 2006, Ivanka emailed her brothers and other Trump executives that partners from the Atlanta firm were coming to New York. “They want to discuss taking over the Tampa job,” she advised. 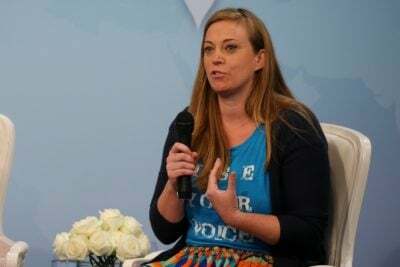 “We have to give them a strong sell about how terrific this job is and that the only reason it is failing is due to the inexperience of the developers.” She did not mention that the Trump Organization had chosen to work with these inexperienced developers. But this pitch would go nowhere, and by early 2007, the Tampa developers had begun getting letters from lawyers representing condo buyers, threatening to sue unless they were released from their contracts and given their deposits back. The developers responded by writing purchasers — “Dear Trump Tower Unit Buyer” — offering excuses and inducements (such as paying interest on their deposits) to try to keep everyone on board. Buyers started filing suits. Despite Donald Trump’s public talk, his organization made no move to invest in the troubled project bearing his name. Its efforts to help SimDag find a lender had gone nowhere. That same day, Trump sent a notice to the Tampa developers, advising them that they were $903,637 behind in their licensing payments, and in default of the licensing agreement for failing to sell at least 70 percent of the condo units within 30 months and start construction within 18 months. Trump threatened to yank their rights to use his name on the building. By May 25, the Tampa developers had fallen more than $1 million behind on their licensing payments. That day, Trump filed suit in federal court against people he had previously described as “the finest partners you can imagine.” He also pulled his name from the project. 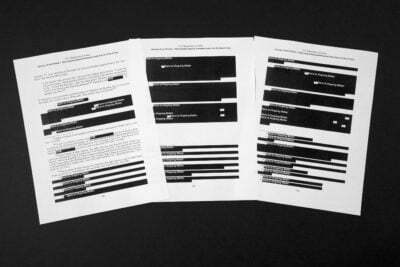 With the lawsuit, he included a copy of his licensing agreement, including a confidentiality clause barring anyone — “under any circumstances” — from even revealing the deal’s existence. (The suit was later settled on confidential terms.) This was the first many Tampa buyers learned that Trump had no equity in the project, but had merely sold use of his name. “Any news re the supposed financing etc.?? ?” Donald Jr. asked his colleagues in early August. But apparently those sympathies didn’t extend to the Tampa developers. In total, they had paid approximately $1.8 million in licensing fees to Trump, court records and documents show. Still, in 2009, Trump filed a new suit against the developers to collect unpaid settlements of $13,448.35 from each, citing the personal guarantees they had signed. Today the site remains vacant, a weedy, fenced-in lot along the Hillsborough River. Additional reporting by Katherine Sullivan.